I always think that teaching a learning about a “contact” is one of the hardest concepts within equitation. To begin, the word “contact” appears on level three of the German Scales of Training. It is defined by “the soft, steady connection between the rider’s hand and the horse’s mouth”. I introduce this idea, or at least make sure they are aware of it, to all my clients. With beginners I encourage a long rein until they have more stable hands so they are more forgiving on the horse’s mouth, and then we slowly shorten the reins so that we have what resembles a straight line from their elbow, through the hand, to the bit, but the riders are always aware that there should be a line of communication between elbow and mouth. With novice riders, I try to get them to feel that they are in a more direct communication with the horse’s mouth, but they don’t have to say anything, and just keep the contact light and still. This is usually accepted and understood by everyone, but it is the next step that can cause problems. That is, going from holding a rein contact to riding into a rein contact. Here we can then see two types of riders developing. Those which become heavy in the hand, perhaps fixing them on the neck, or bringing the hand backwards, and those who increase the driving aids yet let the hand go forwards so the rein contact is always just out of reach for the horse. Let’s look at the first type of rider and the mistake in this understanding. When we start talking about riding into a contact, the rider is by now aware that some horses have pretty, arched necks and some don’t. However unless they understand the biomechanics of how a horse moves they will just squeeze the rein, pull in to their stomach and try to draw the horse into a “pretty, arched outline”. Some horses will unfortunately accept this, but you can see there is tension in their underneck muscles, and the back is not swinging, nor the hind legs tracking up. Others will put the brakes on and not go forwards. 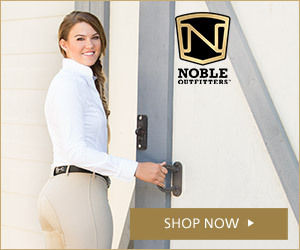 I find the best way to solve this situation is to re-educate the rider; use circles, transitions to engage the hindquarters and focus the rider on having positive hands, using the leg and seat aids, and then hopefully when you remind the rider to lift, present and allow with the hand the rider should be able to feel the horse come through over their back, and their way of going becomes freer and lighter. This should help the rider understand the importance of not tying their horse in at the head. Some riders tend to develop straight, stiff arms when focusing on the rein contact, which then gives a heavy feel on the horse’s mouth and encourages the horse to lean against the hand, raise the head and hollow their back. I’ve recently worked with a client who tends to stiffen her arms. So we’ve done lots of work on bending the elbow, carrying the hands and minimising the rein aids to bring her focus onto the leg and seat aids for turning her horse. This has all been working so that she now has a good arm position, so my next step was to get her to hold a bit more of a rein contact without stiffening her arms. Using half halts and leg aids to “pause the front end so the back end can catch up” we managed to get the trot a bit more active but we were still struggling to find the balance between the leg and rein contact. Because the mare backed off any rein contact (probably because it had been heavy in the past) the focus of riding into the contact had to be, more so than usual, from the hindquarters. Which made me think about the fact my rider could be improved by having a more effective seat and leg, which may make it easier for her to ride towards the contact. Which led me to lunging her in her last lesson without reins or stirrups. The lack of stirrups deepened her seat and made her use her leg, which also stayed underneath her, not creeping forwards. The lack of reins made her aware of the tension she sometimes carries in her arms, and improved her core stability and reduced reliance on the reins. Once she was back in control and off the lunge we revisited stabilising the outside contact to support the shoulder, supporting the horse as she adjusted her neck carriage (even if the reins felt heavy for a moment), and then keeping that same feeling in each hand as the leg continued to push the mare forwards to the contact. The hand then had to allow the mare to take the contact forwards. I think the penny really dropped when my rider realised that as the mare adjusted her balance and neck carriage after the half halt she did need support from the hand momentarily while she found her balance. Then the contact became elastic, light, and steady. 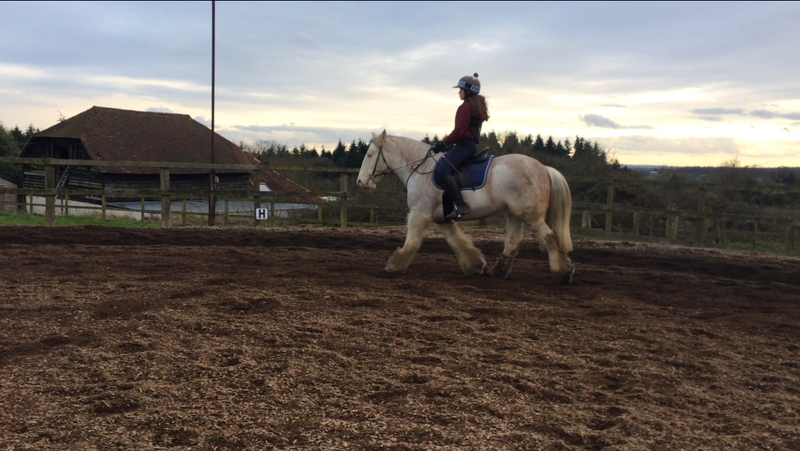 I’m really pleased with this pairs progress because the mare was moving much more actively and started to swing over her back, looking happy in her way of going. My rider also seemed to understand the concept and the feel of the contact, which will enable us to move into more exciting dressage! I think with this rider the focus still needs to be on the driving aids and creating an independent seat so she isn’t as likely to tense her arms up again, but now we can really crack on with the dressage ready for some events! The other type of difficulty that arises with teaching riders about contact is the rider who is worried about having too heavy a hand. These riders usually have light hands, in a good position, but as they use the leg to drive the horse forwards the rider’s hands tend to creep forwards. This is a tricky situation as you don’t want the rider to develop negative hands, yet they can have the same effect as dangling a carrot in front of a donkey. With riders who either give the rein away accidentally through a weak core, or those who are reluctant to have any more than a feather light touch on the reins, I explain how horses like the security and guidance of a rein contact and how the contact gives them boundaries. Imagine you’re holding a child’s hand in a busy street. They like to feel you are always there. If you dropped their hand, they’d stop, worried. Likewise the hand is stopping them stepping off the pavement or detouring into danger. The correct rein contact provides a horse with a sense of security and guides them in their way of going. If a rider has a weak core I’d work them without stirrups to develop this area, before asking them to maintain the hand in the same position as – elbows bent, hand carried – but to close then fingers around the rein slightly more, so they feel they are firmly holding the reins, yet without tensing their arm. They need to become accustomed to closing the hand a bit more positively on the reins, and when they are comfortable we can focus on maintaining a consistent feeling down the reins. Usually, by holding the reins with a bit more grip we immediately get a better contact because the reins aren’t sliding through their hands. Then by using a combination of focusing their attention on the position of their hand, and the amount that they are “holding” the reins we begin to create a better contact. Then as the rider is providing a consistent contact, the horse can be ridden into one. I’ve done some work with a client recently who’s horse has stopped going forwards, which I think is to do with the fact the rein contact is light and inconsistent (I have another client who’s nappy pony goes forward only when there is a rein contact, so that is a similar situation). Last lesson we did a lot of work on her keeping her hands still when she used her leg, and not throw them forwards so that her horse had a contact to seek. I think he was getting fed up of chasing the hand, because as soon as her hands improved he settled into work, looked happier, and was more responsive to her aids. We now need to carry on making her core strong and hands independent so that she can hold the rein contact in a supportive, guiding way to help her horse coordinate himself so the back end and front end work in unison. This pair aren’t ready to ride “into a contact” in as far as pretty outlines are concerned, but it is vital for the horse’s confidence that he has the reins to help keep him straight, or support him if he loses his balance or rhythm. The aim of me as an instructor is to try to create the situation when the rider can feel the correct rein contact, and then they have a goal to aim for and know if they’re right during their own schooling sessions. Then we can look in more detail about the tools they need to ride a horse “on a contact” whether it’s a novice line of communication, or a more advanced rider using driving aids to ride the horse “into a contact”. One analogy I heard recently was that the right hold on the reins is akin to a good handshake. Firm, without breaking your daughter’s new boyfriend’s fingers, without it being limp. I’ve always thought of it as the way you’d hold a child’s hand down the street; not a vice like grip, but one which is secure and comforting so they feel safe.